I am so completely open to the power of suggestion when it comes to food. I either read, see, or hear about food, and then suddenly, I want it that instant. At the end of 'One Hungry Monster', the little boy takes out an apple muffin, and I think to myself, why yes, yes, an apple muffin, that does sound perfect! When we watch a Seinfeld DVD, we generally end up wanting Chinese takeout. Even if we're stuffed. There is always room for Chinese food... Then there is the book, 'If You Give a Mouse a Cookie', that Max loves. Of course, by the end of it, I'm always thinking, wow, yes, a cookie, that is most definitely what I need in my life right now! Why won't someone give me a cookie? So, after reading that book one too many times the other day, I finally said, cookies need to be made. What kind of cookies? Well... we all know what I have been addicted to lately. Stawberries! I promise from now on to rein in the strawberryness. Or at least I will try. It really doesn't help that the Saturday farmers market right down the street sells big boxes of strawberries for like six dollars. So it is just right there begging to be bought and used up. I blame them for my addiction. Heat oven to 350. Whisk 1 1/8 cup flour, baking soda, salt, and orange zest, and set aside. Beat butter, granulated sugar, and brown sugar in a mixer until they are well combined. Then add in the egg and vanilla, and beat until well combined. In a small bowl, toss the chopped strawberries with a tablespoon of flour. Then using a wooden stir, stir in the chocolate chips and strawberries into the dough. Use a tablespoon to scoop the dough onto greased baking sheets. Makes about 24 cookies. Bake 8-10 minutes, until the edges have turned golden brown. How unique! These strawberry cookies look fascinating. LOVE these cookies! And what better way to use strawberries! YUM! 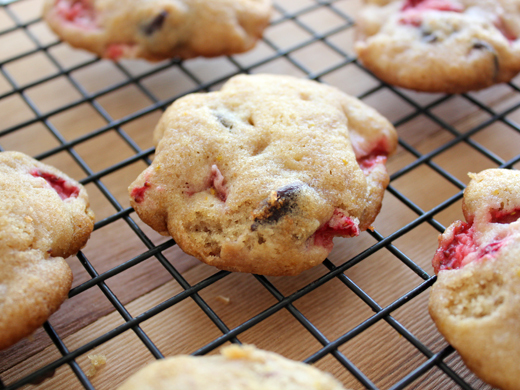 Great idea to incorporate berries into a chocolate chip cookie! They look wonderful! I'm the same way!!! In the "Wedding Planner" when the one guy made Jennifer Lopez macaroni and cheese, that scene literally made my love Kraft Mac and Cheese for most of my high school career. I like the strawberry in these cookies. They're usually used in cakes, so I like the cookie twist. I love the unique combination of flavors in these cookies! Really love the addition of orange zest! We always have strawberries in the fridge and we're glad they are still in season (but maybe they will be gone soon? We'll be in trouble!). These cookies look delicious. I've never seen a cookie recipe with chopped fresh strawberries in it. What a fantastic idea!!!!!! Love the idea of strawberries in cookies! Good addiction to have! These sound wonderful. These sound fantastic and how clever to add strawberries. I bet these were sooo good. Oh yum, chocolate and strawberries always taste so good together. They look absolutely fab Jenn!! These sounds great! I love using strawberries in cookies! They look delicious, though I have never tried strawberries in cookies. Love how you used berries and chocolate chips...delish! Ohmigoodness, these sound heavenly. Strawberries and chocolate and orange in a cookie! Angels should be singing right now. Totally saving this recipe. The little boy I sit for loves the One Hungry Monster book, and I love reading it to him! I need these cookies in my life. They sound amazing, and have everything that I love in them. "If You Give a Mouse a Cookie" is my favorite children's book. When I am in restaurants, I always see other people's food go by and am swayed by what looks best. I totally understand the power of suggestion. These cookies look fabulous, and so simple! Why won't somebody give us THIS cookie? The orange zest adds such a lovely flavor to the chocolate and strawberries. Yummy adaptation of a classic cookie. I've always thought strawberries were too wet for cookies but I guess not! These sound amazing! I love that book by the way...I recently found out that one of my coworkers has never read it and I'm now thinking she must have been severely deprived as a kid as a result! I love the strawberries in these cookies and cannot wait to make it for my kids!I'm positive they're going to love it so much :)Thankyou Jenn for such a wonderful recipe! These look delicious and i like how you added orange zest...that must have made your whole place smell heavenly! These are so different! In a completely delicious and good way, of course! I'm weak to the power of suggestion too. Strawberries are a good thing to get addicted to.....I am trying to imagine the taste of strawberries and orange together....never tried that combo....cookies look awesome....I would love to dunk them in some creamy strawberry milkshake and eat the softened bits....now you know I get exactly the same urges like you....when I see/read/hear about a certain food I need to have it, like now...and now I need to have strawberry cookies! I can soo identify with you! These cookies look positively drool worthy, love the added colour from the srawberries! There's seriously nothing like chocolate and orange! Add strawberry in the mix and you get true perfection! YUM!! !